This is a very easy and QUICK wreath. If you have any old ball ornaments that are chipped on one side, don't throw them away! They can make a beautiful shiny wreath. Weave a long length of ribbon in and out of the wire form. Leave the ends criss-crossed and hanging off the bottom. 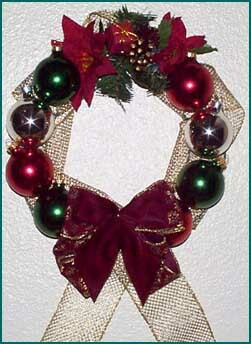 Attach a bow or Christmas florals to the top using thin wire and/or hot glue. Glue the ornaments onto the wire form. Attach a bow and/or Christmas florals to the bottom.